I'm retired and enjoy painting local pits, I have done a painting of Underwood pit. On your site I see that you have a much better photo with a lot more detail in it sent in by Dale Fearn taken by his father before the pit was demolished 1984-1985. I wonder if there is any chance of me having a copy with regards to doing a painting of it please? It would be nice to include it in my collection as I live in Underwood. I have been researching my family tree and found my grandfather (father’s father) Joseph Robinson was killed at Underwood pit on Wednesday 12th December 1917, aged 24 years old. This was four days after my dad had been born. I am currently writing about it for Best of British, the nostalgia magazine. They have said they are interested in the item but of course it does not mean they will definitely publish it. The reason I am writing to you is to ask if you have any photographs of Underwood pit I may send to them with the possibility they may publish it. A jpeg would be fine. Re Robinson query I have all the detail but the pit is wrong it was Selston. Underwood closed in 1876 give him my e mail if he wants it. I have copies of the actual article from the Heanor Observer as Heanor Library have them on micro fiche. 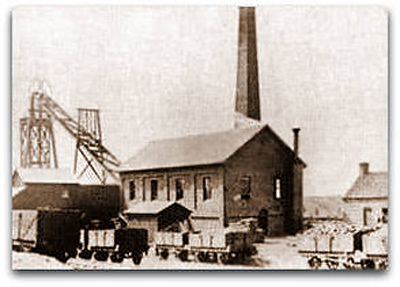 UNDERWOOD COLLIERY(Memorial) The Selston (or Underwood) pit also went back centuries, being taken over in 1728 by Barber Walker & Co when it was probably just an opencast or outcropping site. Barber Walker sank a real vertical mine shaft there in 1831. It was included in the 1842 Children's Employment Commission. The pit at Underwood was 140 yards deep. Workers were let down and up, four at a time by a flat rope. They had no Davy Lamps but fortunately no accidents had been recorded at the pit for two years prior to the Commision in 1842. At that time Barber and Walker owned 12 shafts employing a total of 101 children under the age of 13.